We stayed at Las Nubes de Holbox as part of our Weekend of Wow created with 150,000 Membership Rewards points. Using Pay With Points, available through American Express Travel, you can not only pay for nights at Las Nubes de Holbox but book a plane ticket to Cancun, reserve a rental car to drive to the Chiquila ferry and even buy a diving mask with built-in video camera to film your underwater adventures with whale sharks. Book your trip to Isla Holbox using American Express Membership Rewards Points (as Spot Cool Stuff did) and Las Nubes de Holbox is where you’ll stay. 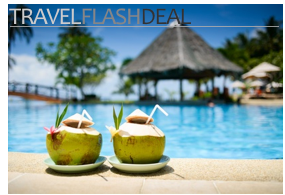 No other hotel on the island can be booked as a rewards trip using the Pay With Points website, available through American Express Travel. If you are paying with cash (how old fashioned) you’ll have several downmarket options, including a tiny US$30 room at the colorful Tribu Hostel. But no hotel choice is as luxurious and as delightful as Las Nubes. The swimming is excellent along the whole length of Isla Holbox’s beach-lined Caribbean coast. It is particularly excellent directly in front of Las Nubes, where two sand bars parallel the coast. Those sand bars make for calm waters for kayaking and swimming. They also allow you to go for long walks in the water; you’ll likely come across crabs, fish, manta rays and perhaps even tiny sea turtles. 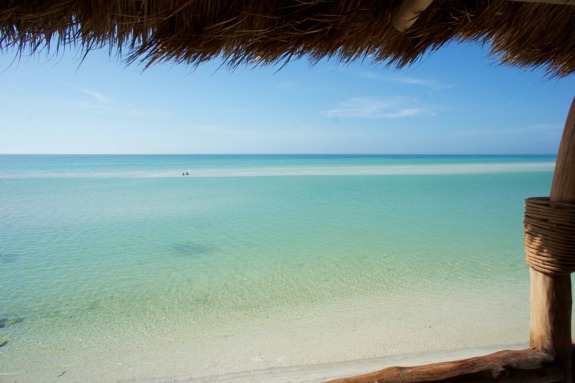 Las Nubes de Holbox is well configured to allow guests to enjoy the water when they aren’t in it. The hotel’s beach bar and restaurant are directly on the water. (Surprisingly, this is not the case at several Holbox hotels, such as the Casa Sandra). Hammocks and cushioned rest areas are scattered around the hotel grounds. At most luxury hotels, it seems like the staff have been given unbendable rules as to what they should do and what they shouldn’t. During our stay at Las Nubes we were constantly (and pleasantly) surprised at how willing the staff was to go out of the proverbial box. If you want the furniture in your room rearranged, they’ll rearrange it. If you want to eat something not on the menu, they’ll prepare it for you (if they can). Want a private romantic dinner for two out on the sand bar? Las Nubes will organize it for you. When we went out on our whale shark swimming tour, the Las Nubes staff kindly packed a basket of three towels for us without us asking them to. When the boat dropped us off at the end of the tour, Las Nubes staff was waiting with cold washcloths and drinks and a helping hand to carry our belongings back to our room. 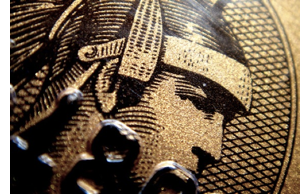 Such touches of personalized service may seem small. But it is amazing how greatly they contribute to a relaxing hotel experience. 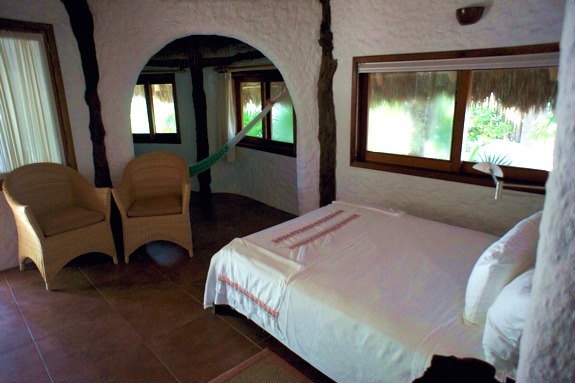 There are no cookie-cutter rooms at Las Nubes de Holbox. Every room is a bit different. Every one has personal touches. Which brings us to . 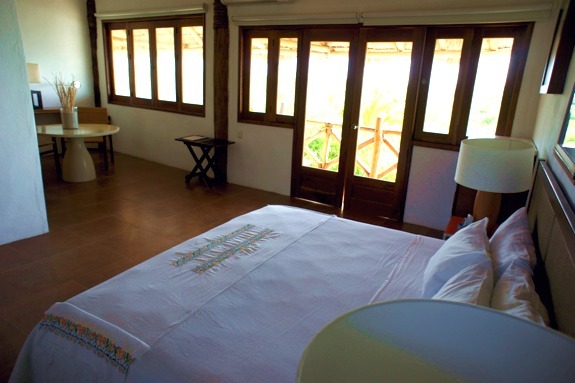 . .
Las Nubes de Holbox Hotel has a variety of rooms with somewhat misleading names. Each has air conditioning and luxury bath amenities. “Premier” rooms are the least expensive. Each is in a self-standing bungalow and features a hammock inside the room. The junior suites are not really suites so much as they are L-shaped rooms. They come in two varieties: ocean view and sunset view. The latter has more limited views of the water than the former. Among the ocean views suites, we suggest #12—it has a private rooftop deck. The master bedroom, room #20, consists of a large bi-level room with a little cushioned outdoors perch. Especially suggested if staying with children. During our visit Las Nubes was building four master suites—actual suites that consist of multiple rooms. The upper level master suite in particular looked absolutely fabulous. They are expected to be completed by Christmas 2011. The restaurant at Las Nubes has one of the more creative menus of any place on the island. This isn’t saying much. 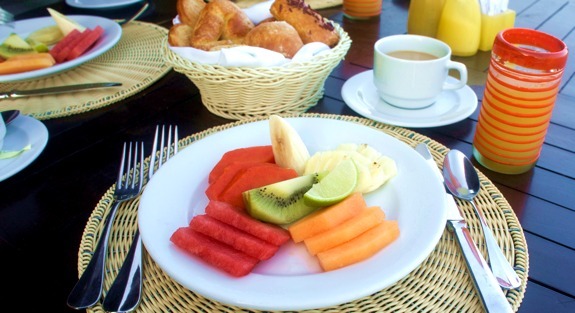 The food selection is one of the drawbacks of Isla Holbox as a whole (unless you like pasta). Dinner options do include Tuna Medallion and Stuffed Fish Fillet with Seafood, each for around US$25. Still, we would have preferred a choice of more inexpensive Mexican dishes that better incorporated the island’s local seafood. On the plus side, the complimentary breakfast included a yummy selection of fruits, warm homemade breads and pastries, tea and coffee. The swimming pool wasn’t large, but with such warm and calm sea waters at the hotel’s edge it need not be. Tour booking is available at the front desk for whale shark trips, fishing excursions or nearly anything else there is to do on Isla Holbox. A recreation room with games, a pool table and TV with DVD player (and a DVD library) stand ready to save the day in case you encounter lots of rain. Free wifi internet, as good as any on the island (which is to say, of average quality in the morning and late at night, slow~ish in the afternoon and evening) is available in the lobby area. At the time of writing, Las Nubes was working to extend the range to the rooms. Use of kayaks and bicycles is complimentary for all guests. 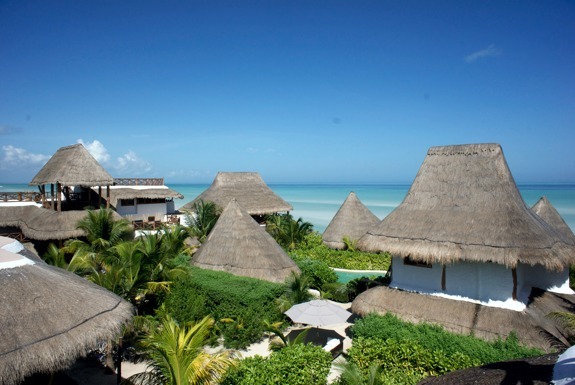 On Isla Holbox there’s no place we’d rather stay than Las Nubes de Holbox Hotel. From its remote-feeling, yet beach-embracing location to its personalized—but never intrusive—services, your experience at Las Nubes is likely to match the WOW factor of Isla Holbox itself. Wow these houses look amazing!!! !